PICTURE COURTESY OF ONTARIO JEWISH ARCHIVES: For Fentster curator Evelyn Tauben, pictures of families standing in front of their storefronts evoke the sense of accomplishment early immigrants felt for building not just a business, but a new life. When you walk along College Street, you are struck by it immediately. Both out of place, yet oddly at home, it brings the contrast of now and then into sharp relief. And it reminds you of a time when Yiddish was the language of Kensington and the market a predominantly Jewish neighbourhood. It’s the Mandel’s Creamery sign, which until recently marked 29 Baldwin St., even after the creamery was replaced by a café. It’s now a temporary window installation at 402 College St. thanks to the Ontario Jewish Archives (OJA), which saved the window from destruction after a new business replaced the Italian café that had preserved the heritage sign. And the sign now has become a symbolic representation of what was a portal to connect Jewish residents to their past and a visual record for all Torontonians to witness. This past summer, Evelyn Tauben, curator of Fentster Gallery, breathed new life into the old sign by partnering with Solomon to display Mandel’s sign in the storefront of Makom, a grassroots Jewish organization. It’s the third installation for Fentster, which takes its name from the Yiddish word for window and is an art collective focused on Jewish themes. By 1931, 80 per cent of Toronto’s Jewish population of 45,000 lived around Spadina Avenue, establishing businesses, synagogues, and organizations. Today, these Jewish establishments are memories of an earlier era. The installation provides Toronto residents with a glimpse of what College Street used to look like, and a reminder of the delis, kosher restaurants, grocers, and Jewish community centres that occupied the once bustling, Jewish downtown street. Mandel’s Creamery, which opened in 1915, was one of those businesses. Jewish residents began to leave the area after the Second World War, but Mendel’s Creamery remained until the late 1970s, even as all the other storefronts in the neighbourhood changed. While the sign has received positive feedback from the Toronto community, it evokes but a memory and can represent only a snapshot of what the area once looked like. Aware of this, the curators have changed the original signage from reading: “Butter, Cheese, Cream, Eggs: Fresh Every Day” to “Butter, Cheese, Cream. 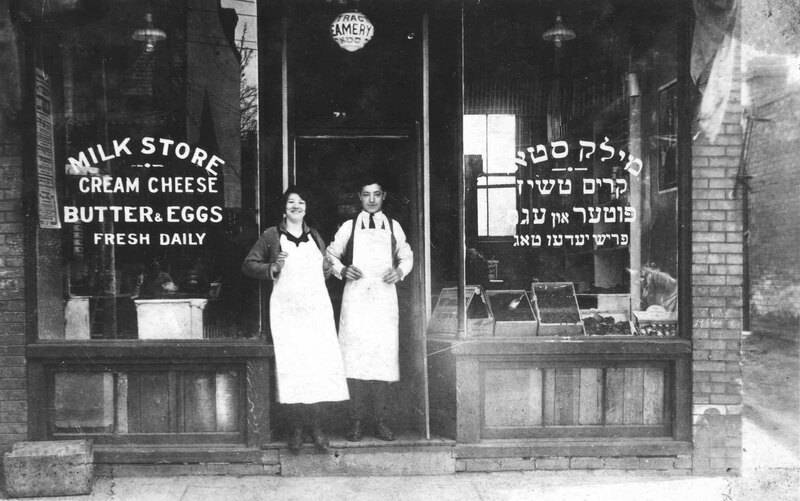 Eggs: Only Memories” as kosher foods are no longer “fresh every day” in this part of Toronto. An enlarged 1920s black and white archival photograph of Trachter’s Milk Store, a similar Jewish dairy, forms the visual backdrop. Not just a connection to the past, however, the sign may also be a connection to the future, as that once vibrant, thriving Jewish community is returning to downtown. Fentster fronts Makom, the face of a new Toronto Jewish community whose membership is only growing. The Mandel’s Dreamery will remain installed at Fentster @ Makom, 402 College St. until October 30. The family name of the of the creamery was misspelled. It is Mandel, not Mendel. The name of the installation was Mandel’s Dreamery.